How many times in our lives do we get caught in the rain? Or have to deal with the nuisance of an umbrella? Rain is one of those things that we need but often find rather inconvenient. Have you ever taken the time to closely examine a raindrop? For one of my pieces in the September exhibit of Landscape Bodyscape, I decided to do just that. 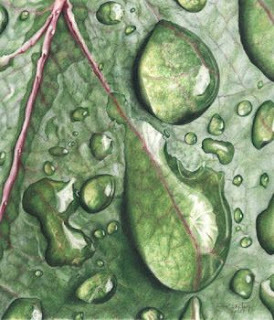 Even though I magnified these Raindrops a few thousand times, the painting is only 8.5” by 7”. It’s done with Prismacolor colored pencils on Stonehenge paper. There are ten or more layers of color in places to develop that wet look. Part of the challenge with Raindrops was actually the color itself. It’s my personal opinion that Prismalcolor pencils are a bit lacking in the green family. This required more layering to achieve the desired colors. But I’m hooked on the blending ability of these pencils, so I don’t mind the extra layering. It’s quite therapeutic actually. Dee–Your blog is great……….so interesting and genuine. You are an inspiration! Hiya Dee, ooh I LOVE this raindrop painting! Just like your other work, you really have a talent for allowing others to “feel” the art. It’s just lovely. Keep up the good work! I still find it so awesome that another human being with eyes and fingers just like mine can create such beauty. I think that everytime I walk down my long, long hallway, which is the new home of the beautiful piece you did for me. I have surrounded it with photographs of the kids in all shapes and mismatched frames. It really is something. I can’t wait for you and Holly to see it. Love to all!! Thanks for your support!! I hope you all find enough value here to keep coming back. This new adventure has opened the door to a different world of challenges for me. I guess we’ll all see how it goes. Like, believe it or not, I just figured out exactly how the comment things actually works.